It’s time to add yet another name of note to the growing cast (how many characters are left?) of Warner Bros.’ first Batman V Superman follow-up film, writer/director David Ayer’s Suicide Squad, introducing some of the most brutal and fan-favorite villains DC Comics ever produced; expected to put the director’s experience in gritty, grounded crime stories to good use. With production on the film now under way, it was assumed that most, if not all of the main roles had been weeks of months ago. 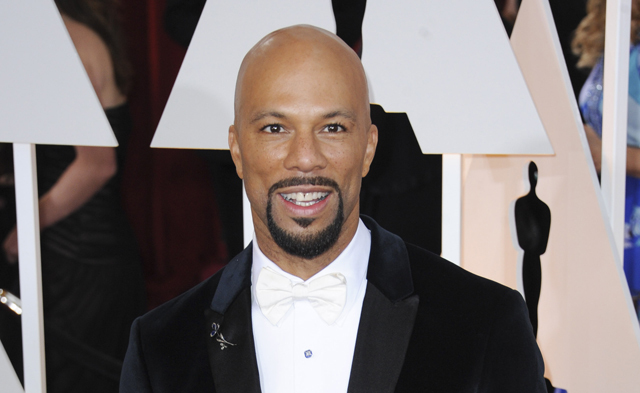 However, now comes word that hip hop artist/actor Common (Selma) has joined the film in an unknown role. A bit of news sure to get fans speculating, considering he was previously set to play Justice League hero John Stewart a.k.a. Green Lantern in WB’s cancelled team up. The report comes from THR, with no further information on what role Common could be playing, simply stating that he has “closed a deal” to appear in the film. The fact that his role and the deal making it possible weren’t finalized by the time filming began isn’t entirely uncommon (pun intended), but it does cast doubt on the idea of him playing a central figure – in this film, at least. Common, having most recently turned in roles for both Selma and Run All Night is just the latest past collaborator of David Ayer to find a role in Suicide Squad, having appeared in the director’s second feature film, Street Kings (2008). And although his Run All Night co-star Joel Kinnaman has been cast as Squad leader Rick Flag, all signs point to Common playing a smaller – but not necessarily less important – part in the film. It had one time seemed that David Ayer would not only be handling the introduction of classic villains like The Joker (Jared Leto), Harley Quinn (Margot Robbie) and Deadshot (Will Smith), but had managed to score lesser-known actors from his previous films major parts in DC’s shared universe. But no sooner had Jim Parrack (Fury) been rumored as the new Deathstroke – replacing Joe Manganiello (Sabotage)– and Scott Eastwood (Fury) for Steve Trevor were those rumors debunked. Now, they’re both rumored to be playing smaller roles – far more in keeping with their previous work. Fans may not need to look far for theories on who Common might be playing in a small, medium, or larger role within the Squad or Belle Reve Prison. It had seemed odd that with so much inspiration taken from John Ostrander’s initial “Suicide Squad” comic run, the presence of Bronze Tiger (portrayed on Arrow by Michael Jai White) had never been mentioned – especially since he is typically portrayed as one of the team’s leaders in the field. The number of villains that Suicide Squad will apparently introduce for later solo films led to other speculation. We had figured an appearance from Black Manta (also a familiar face in the New 52 comic) would lay the groundwork for an Aquaman debut, but a link to the King of Atlantis was rumored in an entirely different form. Yet either of these characters would seem a strong fit for Common’s past roles – demanding a truly intimidating man of few words. There has also been little confirmed about the operatives that the Squad will be facing, meaning it’s possible Common could be standing against the main cast, not among them. Whether such a role would be a one-time gig or a recurring one is just one of many remaining mysteries surrounding the production. What this casting news may be able to rule out, though, is a return to the role of Green Lantern John Stewart. Common had recently told us he was still open to playing the part, but with a solo Green Lantern reboot not planned until 2020, casting a new actor in the part – and potentially leaving that choice to David Ayer – seems a stretch. However, it’s not outside the realm of possibility. For all we know, Ayer’s past work with Common may have had little to do with his casting, if, indeed, he is set to appear as John Stewart (even a pre-power ring version). The sudden casting news may confirm his claim that he would jump at another chance to play the hero – but that’s clearly taking a leap. For now, we would advise fans to remain patient, and not to hold their breath for any revelations. Who do you hope to see Common play in DC’s Movie Universe? Is there a villain on the Squad or in Belle Reve that you think he’d be perfect for, or would you rather he operate on the side of the film universe’s heroes? Go ahead and let your thoughts take over in the comment section below.